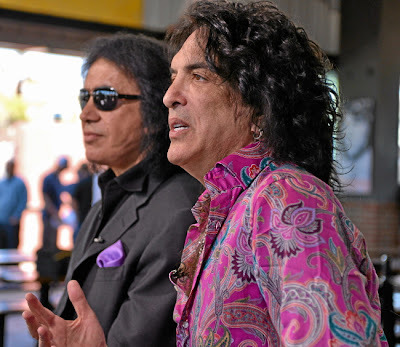 And that's just fine with KISS icon Gene Simmons, who along with band co-founder Paul Stanley owns the rock 'n' roll-themed restaurant Rock & Brews opening on Thursday. "It's less about the celebrity and more about the experience," Simmons said of the burgeoning chain of craft beer-centric restaurants that got its start in El Segundo. "It's not about us," he added. "It's about you. We just work here. We want you to be a rock star. You may not be a rock star, but we'll make you feel like one. " Torrance becomes the third location for Rock & Brews, which first opened in 2010 in downtown El Segundo as a modest outdoor beer garden to test the concept before a revamped, refined version reopened in early 2012. The 5,400-square-foot Torrance restaurant sits in a sliver of the city adjacent to Redondo Beach's Riviera Village at the intersection of Pacific Coast Highway and Palos Verdes Boulevard. The building once housed a Tony Roma's and, most recently, Oliver's Cafe. A second Rock & Brews was unveiled in March in Los Cabos, Mexico. Another opens this summer in the renovated Delta Air Lines terminal at Los Angeles International Airport, while one in Agoura Hills is slated for a fall opening. The ambitious goal is to open as many as 100 Rock & Brews in the next five years. Just about everyone involved in the concept is a rock star in their particular field. Founding brothers Dave and Del Furano have toiled in the music industry since the early 1970s, when they worked with Bill Graham at San Francisco's famed Winterland and met such bands as the Rolling Stones, Grateful Dead and many others. Over the decades, the pair became known for their tour management and merchandising skills, which is how they hooked up with KISS, a band they've worked with for about 15 years. "This has been a dream of mine for 30 years to open a music-themed, concert-themed restaurant," Dave Furano said. "Beer drinking and rock 'n' roll are synonymous. It worked right out of the chute. " To make the dream a reality, he contacted South Bay restaurateur Michael Zislis, who has opened a series of successful restaurants, including Manhattan Beach's Rock'N Fish and BrewCo, as well as luxury boutique hotel Shade. "They wanted to do a rock 'n' roll concept -- they didn't know exactly what that concept was -- where they could display all their old vintage rock 'n' roll artwork," he said. "And it kind of incorporated all my favorite things, which are beer, food and rock 'n' roll "
The motif resembles a backstage concert environment, but with a play area for kids (Zislis has six children) and water bowls for dogs on the expansive patio. "There's a sense here of being backstage at a show, but also being in your living room with friends," Stanley said, noting that the chain isn't intended to be a 21st century version of the Hard Rock Cafe chain, with its ubiquitous T-shirts emblazoned with the city's name aimed at tourists. "A theme restaurant is no excuse for crap food," he added. "And our palettes are refined enough that we know junk when we eat it." Jon Mesko, the partner of the Torrance location, described the new location as "Rock & Brews 2.0." It includes patio fire pit tables with enough room for up to 18 people to sit around, lounge tables equipped with iPads and draft beer taps so patrons can open a tab and pour beers for themselves, and a "Yellow Submarine" play area designed by Mesko's 6-year-old son, Logan. But the focus is firmly on craft beer. Rock & Brew Torrance has 73 draft beer handles compared to 52 in El Segundo, and South Bay breweries such as Torrance's Strand Brewing Co. are prominently featured. "It might surprise and shock people, but you're not going to find Bud Light on tap here," Mesko said, although it is available in a bottle. Depending on how work progresses, the restaurant was eyeing a possible soft opening this weekend before officially throwing open its doors to the public on Thursday. "We're coming into the neighborhood, but we're also supporting the neighborhood," Stanley said. "One of the things we've found out as we've become successful is that giving back isn't an option, it really is an obligation. It's something that's karmic and makes you feel good." Those aren't words one might expect from your typical self-indulgent rock star. But then Rock & Brews, which faced opposition from some neighbors before it opened, is intended to be more community-oriented rather than emphasizing the magic of rock 'n' roll. "It's dog friendly, kid friendly, and, to a lot of people, that's magical," Zislis said.